Posted 10/27/2017 5:06pm by David Paulk. We enjoyed the gorgeous weather this week harvesting carrots and Jerusalem artichokes, of which both will be at the market this week! Tomorrow will again be a lovely day to bring your family and friends to the farmer's market to buy your fresh, organic veggies, and pick up baked goods, meat and your favorite libation for the week! In case you didn't know our market sells local wines, whiskey and now hard cider. We hope to see you there! - Jerusalem Artichokes (New! ): a.k.a., sunchokes; look like knobby potatoes, but taste like artichokes. Really good, peeled, sliced/diced, lightly tossed with olive oil, roasted in the oven at 350 degrees until fork tender, and sprinkled with sea salt...like artichoky potatoes. They get a little brown and crispy...yum! - Romaine (Back! ): fall fresh-harvested, tasty and crisp! - Beets: Just harvested Golden and Red beets. Great either boiled or roasted, like a potato. Wonderful on a bed of arugula with goat cheese and walnuts. - All Purpose & Whole Wheat Flour: Yes, we grew wheat on our farm and have milled it into flour! That's 2-lb bags of certified organic whole wheat and All Purpose flour! - Bibb Lettuce: Lovely green and light red-accented leaves in that beautiful bibb bouquet. Leaves are soft and perfect as a salad bed or for wraps. - Super Sweet Superstar Onions: If you've been to our stand over the years, then you know these super sweet onions! They are large, white and very similar to vidalia onions. They are very good raw on burgers, in salads, or sauteed until caramalized. Make sure you cook them on med-low heat, because the sugars in them can burn if too hot. - Potatoes, Red, Blue, and German Butterball: Four varieties of tasty Irish potatoes. The blue potatoes are blue inside and out, full of anti-oxidants, and great for making crispy fries or roasting. German Butterballs are a creamy yellow/white and great for boiling, roasting or making mashed potates. And we have our delicious Mountain Rose (red) potatoes, which are absolutely delicious and very versatile. - Ostergruss Radishes: Reddish-Pink, carrot-shaped radishes with crisp texture and spicy flavor. German variety translates to "Easter Greeting." Beautiful addition to salads and perfect for dipping and vegetable platters. Posted 10/20/2017 6:54pm by David Paulk. We've been busy on the farm prepping the ground for fall planted crops such as more wheat and oats. Soon we'll be planting garlic. The seasonal cycle of the farm continues, which brings us to the bounty of fall. Tomorrow will be a perfect day to grab your family and friends and head to the farmer's market to buy your fresh, organic veggies, and pick up baked goods, meat and booze for the week! In case you didn't know our market sells local wines, whiskey and now hard cider. We hope to see you there! - Ostergruss Radishes (New! ): Red, carrot-shaped radishes with crisp texture and spicy flavor. German variety translates to "Easter Greeting." Beautiful addition to salads and perfect shape for dipping and vegetable platters. - Covington Sweet Potatoes (New! ): We have another new orange sweet potato for you to try! Delicious roasted, baked, mashed or make a sweet potato pie. See recipe on our Web site. 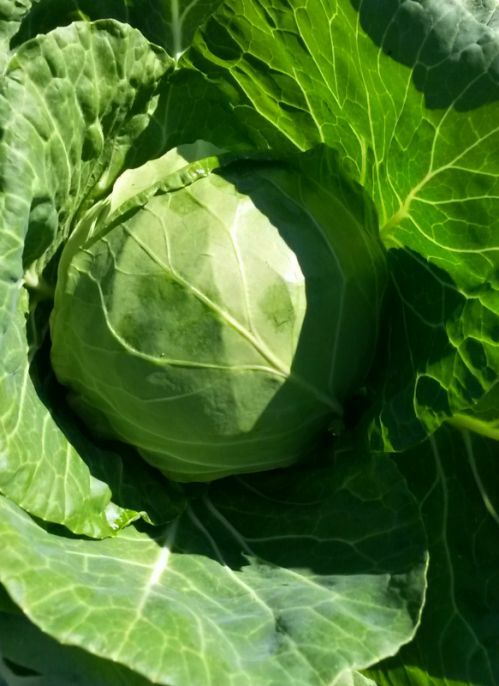 - Cabbage: Smallish cabbages that are so great fresh and are slightly sweet! Wonderful simply sauteed, in soups, use for cabbage rolls...and so on. Much tastier than what you get in the store. Also, try your hand at making homemade sauerkraut! Just ask Jen. - Bibb Lettuce: A lovely green and light red accented leaves in that beautiful bibb bouquet. Leaves are soft and perfect for as a salad bed or for wraps. - Zucchini: The squash looks excellent and we have a plentiful supply. Posted 10/13/2017 4:46pm by David Paulk. It's the bounty of fall! We have such a big variety of vegetables right now! So many that we're running out of room in our already expanded stand! But no worries, it will all be there for you to enjoy this week. Please see below for all that we'll have at market tomorrow. We hope to see you tomorrow at the market and have a few new things this week. - All Purpose Flour (Back! ): We have milled some of our wheat as All Purpose Flour. We will also have whole wheat for sale tomrrow. 2-lb bags. - Broccolini (New! ): It is similar to broccoli but with smaller florets and longer, thin stalks. It is a natural hybrid of broccoli and an asian vegetable, which means it has a milder broccoli flavor, is tender and cooks quickly. See recipes on our Web site. - Cabbage (New! ): Smallish cabbages that are so great fresh! Wonderful simply sauteed, in soups, use for cabbage rolls...and so on. Much tastier than what you get in the store. Also, try your hand at making homemade sauerkraut! Just ask Jen. - Carrots (Back! ): We have freshly harvested, sweet bunches of carrots! - Green Peppers (New! ): These are tasty, savory peppers that are wonderful in any vegetable dishes! - Beet: Just harvested Golden and Red beets. Great either boiled or roasted, like a potato. Wonderful on a bed of arugula with goat cheese and walnuts. - Whole Wheat and All Purpose Flour: Yes, we grew wheat on our farm and have milled it into flour! That's 2-lb bags of certified organic whole wheat and All Purpose flour! - Romaine Head Lettuce: Our favorite lettuce is back and we have a good supply for this market. - Sweet Jimmy Nardello Italian Peppers: They are red, but not at all hot. When sauteed or med-low heat, the sugars in them caramelize and get even sweeter. These are the peppers that Italians layer on Italian subs. They are soooo good. - Shishito Peppers: Japanese appetizer peppers that are so delicious and easy to prepare. Just toss the whole pint of peppers into a skillet of olive oil, on medium heat; saute until they shrivel and char, just slightly. Drain peppers onto a paper towel and then plate up with a sprinkle of sea salt, served with an ice cold beer or dry white wine. Eat the whole pepper, except stem. Maybe 1 in 30 have some very mild heat. Enjoy! - Radishes: Radishes, the gateway vegetable to shopping regularly at the farmer's market. Delicious, a little spicy, and local. Yum! - Spinach: BLS (Big Leaf Spinach). Ideal for cooking. We think you'll like the naturally sweet flavor. 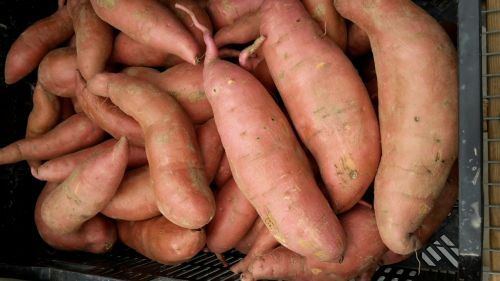 - Sweet Potatoes, Beauregard & Murasaki: Ye ask and ye shall receive your favorite sweet potatoes! Traditional orange and Japanese purple (outside purple/inside white). - Zucchini : The squash looks excellent and we have a plentiful supply. - Fresh Turmeric: The queen of natural anti-inflammatory foods is here! 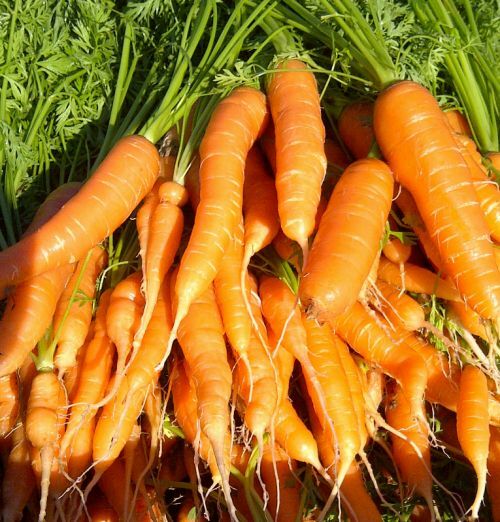 Bright orange and tasty grated into salads or added to vegetable dishes. Key ingredient in curries. Add to smoothies for an anti-inflammatory bonus. Posted 10/6/2017 6:14pm by David Paulk. The season is rushing into fall with the cool nights and warm sunny days. Here on the farm we've been super busy harvesting (more) sweet potatoes, fall seasoned crops and planting cover crops for the winter months. We hope to see you tomorrow at the market and have a few new things this week. - Spinach (New!) BLS (Big Leaf Spinach). First cutting. Ideal for cooking. We think you'll like it. - Sweet Potatoes (New! ): Murasaki variety. Purple on the outside, white on the inside. Salad Mix: Yes, we have ready to eat, tasty salad mix! - Sweet Potatoes, Beauregard: Ye ask and ye shall receive your favorite sweet potatoes! - Fresh Ginger: what you've all been asking for is finally here! 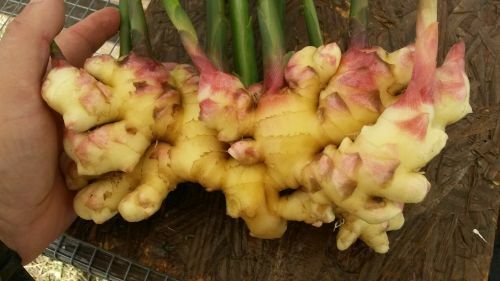 Freshly harvest ginger has no tough skin and doesn't need to be peel before grating. Naturally sweet and aromatic. Simply grate and add to any vegetable dish. Recipes at www.sassafrascreekfarm.com/recipes. 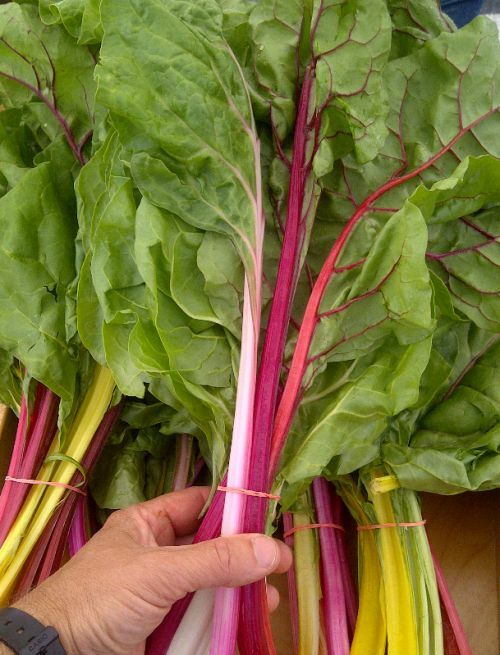 - Rainbow Chard: We have an excellent supply of delicious rainbow chard! Saute like you would kale and enjoy! - Whole Wheat Flour: Yes, we grew wheat on our farm and have milled it into flour! That's 2-lb bags of certified organic whole wheat flour! - Rolled Oats (Oatmeal): We have 1.8-lb bags of rolled oats (oatmeal), from oats grown on our farm. They have a wonderful nutty flavor and are certified organic, like all of our produce! Cook them as you would Quaker oatmeal. 2:1 ratio of water to oats; cook time 10 -15 mins or until desired consistency. - Espelette Peppers: delicious spicy, slightly smoky, and sweet! Beautiful deep red peppers that are delicious raw, cooked, or dried and then ground into paprika powder. They hail from the Basque region of France and are primarily grown for a sweet, hot paprika. You can regulate the heat level by how many seeds you leave in. If you leave all seeds in, it's about jalapeno hot. Great in salsa! Freeze and use over the winter in chili! - Cherry Tomatoes: We have your favorite sweet, red cherry tomatoes. Posted 9/29/2017 4:37pm by David Paulk. It's the best of both seasons, the bounty of summer and early fall, a wonderful time of year to enjoy an outing at the market with your friends and family to stock up on fresh, certified organic veggies for the week! To help you plan, visit sassafrascreekfarm.com/recipe for easy recipes using all of our produce. We so appreciate your support and love to see you and hear how you are doing. - Salad Mix (Back from Summer vacation! ): Yes, we have ready to eat, tasty salad mix! - Sweet Potatoes, Beauregard (New! ): Ye ask and ye shall receive your favorite sweet potatoes! - Kale, Curly & Lacinato (New! ): Great sauteed, braised, in soups, as chips or in smoothies. 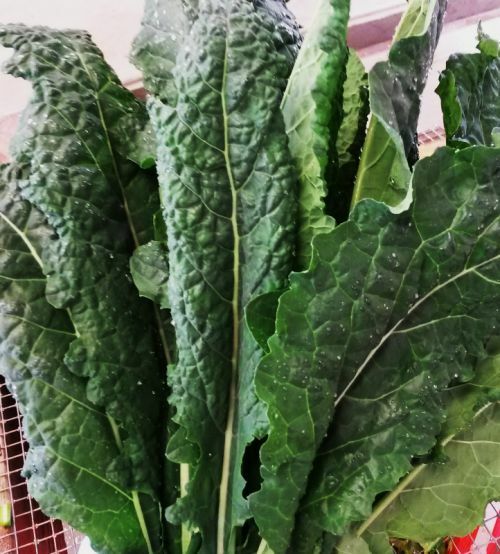 Lacinato Kale is also known as "Dino" or "Tuscan" Kale. - Fresh Ginger (New! ): what you've all been asking for is finally here! Freshly harvest ginger has no tough skin and doesn't need to be peel before grating. Naturally sweet and aromatic. Simply grate and add to any vegetable dish. Recipes at www.sassafrascreekfarm.com/recipes. - Fresh Turmeric (New! ): The queen of natural anti-inflammatory foods is here! Bright orange and tasty grated into salads or added to vegetable dishes. Key ingredient in curries. Add to smoothies for an anti-inflammatory bonus. - Beet Bunches: Just harvested Chioggia, Golden and Red beets. Great either boiled or roasted, like a potato. Wonderful on a bed of arugula with goat cheese and walnuts. - Summer Squash, Zucchini and Zephyr: The squash looks excellent and we have a plentiful supply. Posted 9/22/2017 8:00am by David Paulk. How about coming by the farmers market tomorrow and supporting your local farmers before you go to the County Agricultural Fair! Bring your friends and family to stock up on fresh, certified organic veggies for the week! Easy recipes at sassafrascreekfarm.com/recipe . We so appreciate your support and love to see you and hear how you are doing. - Kale, Lacinato (New! ): Great sauteed, braised, in soups, as chips or in smoothies. Lacinato Kale is also known as "Dino" or "Tuscan" Kale. - Fresh Turmeric (New! ): The queen of anti-inflammatory is here! Bright orange and tasty grated into salads or added to vegetable dishes. Key ingredient in curries. Add to smoothies for an anti-inflammatory bonus. - Beet Bunches: Just harvested Chioggia and Red Ace beets. Great either boiled or roasted, like a potato. - Whole Wheat Flour: Yes, we grew wheat on our farm and have milled it into flour just today! That's 2-lb bags of certified organic whole wheat flour! - Sweet Orange Peppers: Oranos peppers are bright orange, shiny and sweet. So, good raw or grilled! Freeze whole and enjoy sauteed in the middle of winter. - Summer Squash, Zucchini and Zephyr: The squash looks excellent and we have a good supply. 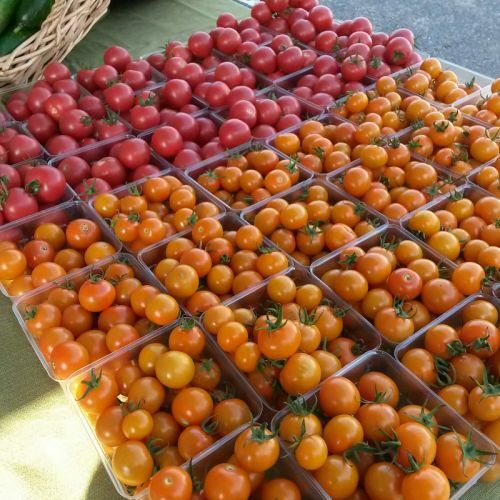 - Cherry Tomatoes: We have your favorite Orange, Red, Yellow cherry tomatoes. They each have their own flavor some sweet and tangy and some sweet with less acid. - Freezing/Canning Tomatoes: We'll be bringing freezing/canning tomatoes this Saturday. So come and get your 20 lb box and put them up for the winter season. If you would like to reserve 1 or more boxes for pickup at tomorrow's market, please email us today with your name, no. of boxes and when you will pick up at market. Posted 9/15/2017 5:41pm by David Paulk. We are so thankful that the forecast hurricane spared us but humbled by the power of the weather. 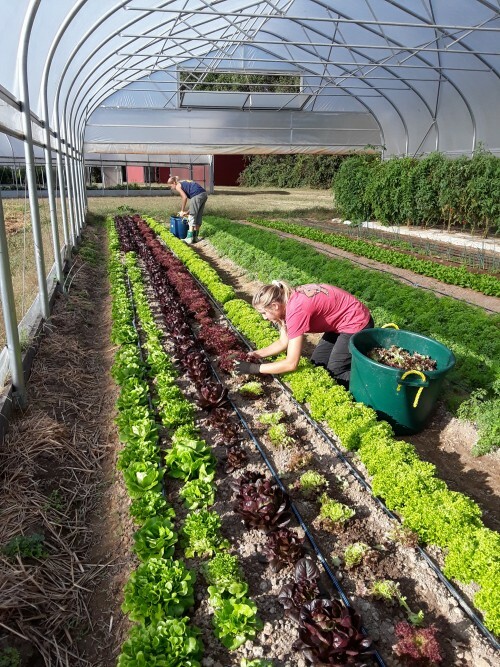 The cooler weather has been excellent for beginning the fall season of change here on our farm. So come to the market tomorrow and enjoy some local freshly harvested organic vegetables. - Arugula (back! ): After a two week gap, we've got your baby arugula back on the stand. - Radishes (Back! ): Radishes, the gateway vegetable to shopping regularly at the farmer's market. Delicious, a little spicey, and local. Yum! - Beet Bunches! : Just harvested Chioggia and Red Ace beets. Great either boiled or roasted, like a potato. - Romaine Head Lettuce (back! ): Our favorite lettuce is back and we have a good supply for this market. - Rolled Oats (Oatmeal): We are selling 1.8-lb bags of rolled oats (oatmeal), from oats grown on our farm. They have a wonderful nutty flavor and are certified organic, like all of our produce! Cook them as you would Quaker oatmeal. 2:1 ratio of water to oats; cook for 10 mins or until desired consistency. - Sweet Orange Peppers: This is pepper season. Come and get them! 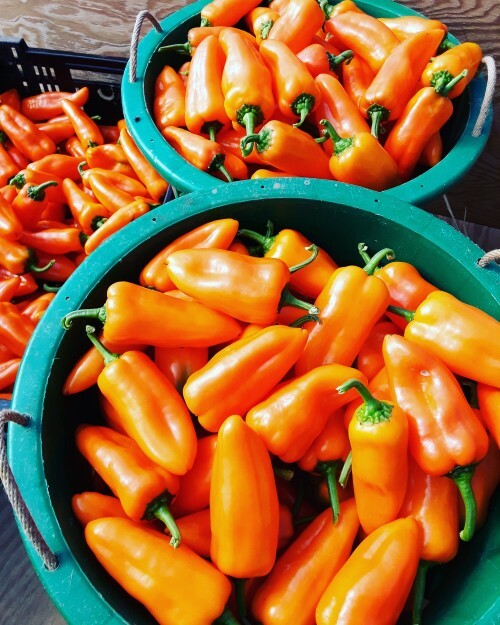 Our Oranos peppers are bright orange, shiny and sweet. So, good raw or grilled! Freeze whole and enjoy sauteed in the middle of winter. - Canning Tomatoes (Back): We'll be bringing canning tomatoes this Saturday. So come and get your 20 lb box and put them up for the winter season. Posted 9/8/2017 7:13pm by David Paulk. Enjoy this amazing weather by coming by the market with your family and friends and picking up your fresh organic veggies for the week. See what we'll have below! - Rainbow Chard (new! ): You are probably starting to greens about now? Well, we have delicious rainbow chard! Sautee like you would kale and enjoy! - Beet Bunches! : Great either boiled or roasted, like a potato. 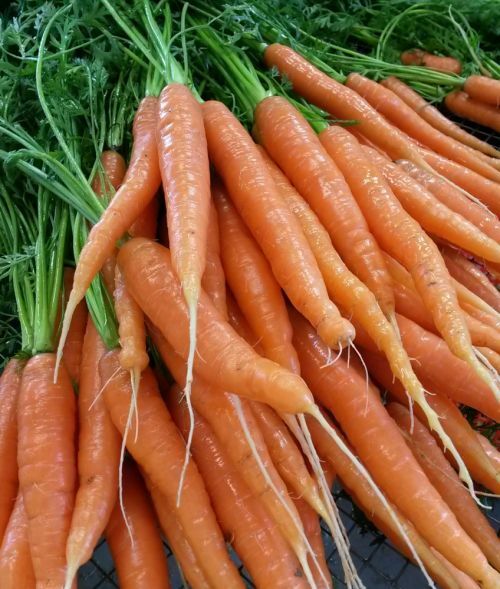 - Carrots: Yes, bunches of fresh carrots are back from their summer vacation and ready to flavor your salads and accompany your meats when grilling/roasting. 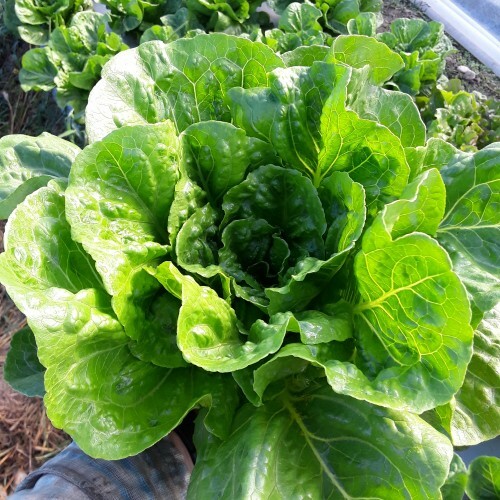 - Head Lettuce (limited quantity): We have green leaf, summer crisp and only a few romaine this week! - ORANOS Sweet Orange Peppers: Bright orange, shiny and sweet. So, good raw or grilled! Freeze whole and enjoy sauteed in the middle of winter. - Summer Squash, Zucchini and Zephyr (we have more this week! ): Our new planting of delicious summer squash is now producing. - Cherry Tomatoes: We have your favorite orange, red and yellow cherry tomatoes. They each have their own flavor some sweet and tangy and some sweet with less acid. Posted 9/1/2017 1:35pm by David Paulk. It's Labor Day weekend! Celebrate what's left of summer (I know it doesn't feel like it) by coming to the market to get your favorite veggies for cookouts and the week's meals. We'll have plenty of BEETS, GREEN BEANS, CARROTS, LETTUCE, SWEET PEPPERS, SUMMER SQUASH AND TOMATOES and more! See below. Don't forget to reserve one of our BOXES OF TOMATOES to freeze or can and add to your soups/stews or make sauce with in the winter. Don't put off to the last minute! And as always, the early birds are usually rewarded! - Whole Wheat Flour (New! ): Yes, we grew wheat on our farm and have milled it into flour just today! That's 2-lb bags of certified organic whole wheat flour! - Head Lettuce (Back! ): We have green leaf and romaine! - Green Beans: tasty, crisp, fresh green beans! 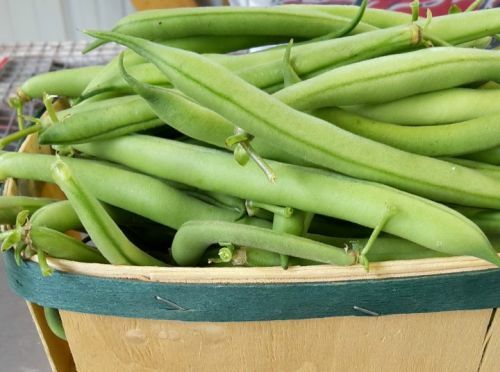 We have plenty of green beans this market! - Tomatoes, Red Heirloom and Red Slicers: We have the most delicious German Johnson and traditional, very tasty red hybrid slicing tomatoes. 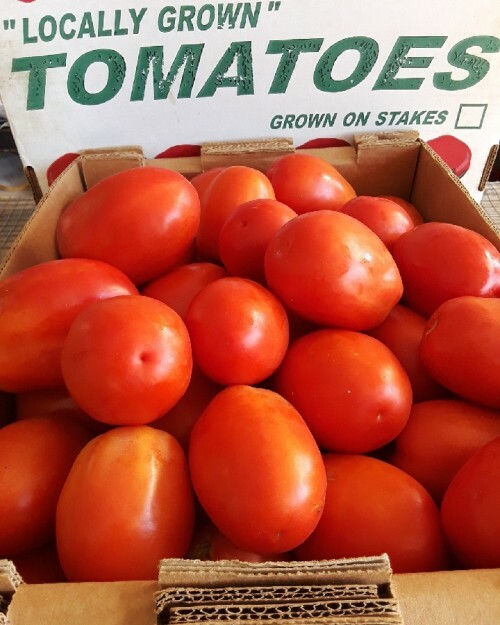 - Tomatoes for Freezing: 20-lb boxes of certified organic tomatoes for just $20! What a deal! Reserve a box today for pick-up at market tomorrow. If you've never canned, no worries! You can always make sauce and freeze or just freeze them whole. You’ll find easy instructions at www.sassafrascreekfarm.com/recipe. 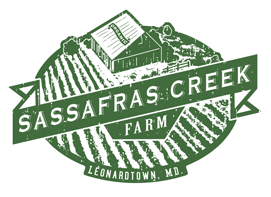 To RESERVE 1 or more boxes, please email us at sassafrascreekfarm@gmail.com, and provide your Name, Number of Boxes, Phone Number, and approximate Time you will pick up at market (9am to 1pm). Note that if you haven't picked up your box by noon tomorrow, we will sell to another customer, UNLESS you let us know that you will be picking up after noon (market ends at 1pm). Thank you! 20-lb Box of Tomatoes for Freezing or Canning! Posted 8/25/2017 6:43pm by David Paulk. It's a great day to pick up your summer veggies for your weekend cookout and the week's meals. We have plenty of veggies, but in particular we have a lot of CARROTS, GREEN BEANS, BEETS, CHERRY TOMATOES, POTATOES, and SHISHITO appetizer peppers! Don't forget to reserve one of our BOXES OF TOMATOES to freeze or can and add to your soups/stews or make sauce with in the winter. Don't put off to the last minute! And as always, the early birds are usually rewarded! - Carrots (Back! ): Yes, bunches of fresh carrots are back from their summer vacation and ready to flavor your salads and accompany your meats when grilling/roasting. - Summer Squash, Zucchini and Zephyr (Back in limited quantity! ): We have a new planting of delicious summer squash that is just starting to produce.